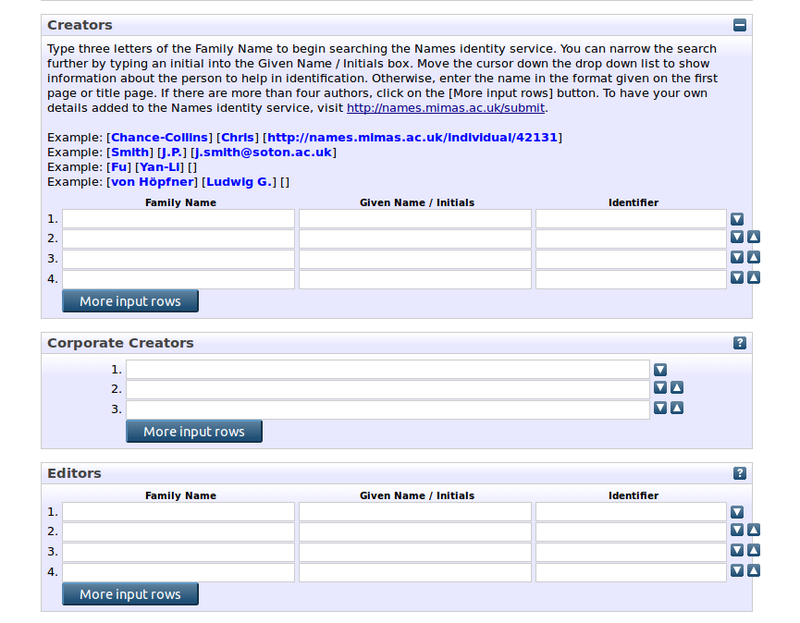 This summer, JISC funded the Names Project to build a plugin for the EPrints software. In this post, developer Phil Cross describes his work on this. The EPrints software has been designed to ease the process for creating add-ons and customisations for a repository. We wished to provide an automatic search of the Names API when users type author or editor details into an eprint creation form. We also wanted to be able to present disambiguating information to allow the selection of the correct author and to have the Names-assigned person URI added to the eprint metadata. We discovered that EPrints already has a built-in autocomplete function that searches over existing repository authors and that there is also an existing creator identifier field that allows the system to identify authors of multiple eprints. We therefore created an augmented version of the existing name autocomplete script that searches the Names API. The search pulls back affiliations, fields of interest and publication details as well as name details and the person URI. When this script is inserted into the code for a specific repository, it overrides the global script, adding the new functionality. Simply removing the script returns the repository to its default behaviour. The name details are displayed in a drop-down list together with the Names URI. Moving the cursor down the list opens a box next to each entry that contains the disambiguation information. Selecting a name adds the name details and URI to the form. We were also able to make changes to the context-sensitive help for the author and editor fields. The altered help text contains information about the Names API search and provides a link for authors who wish to add their own details to the Names database. The Extension Package produced can be used with any EPrints 3.x installation by unzipping the compressed package into the top directory of the chosen repository (a single EPrints installation can run multiple repositories). To disable the Names functionality, the administrator simply needs to delete the three files added. The package and instructions on how to install it are available on the Names site. The newest version of EPrints, version 3.3, contains access to a new development called the Bazaar Store. This is an application store for the EPrints platform that enables repository administrators to install EPrints Plugins and Extensions with a single click. We have created a Bazaar Package that is a version of the Names Extension Package and this is now available in the Bazaar store for users of version 3.3. 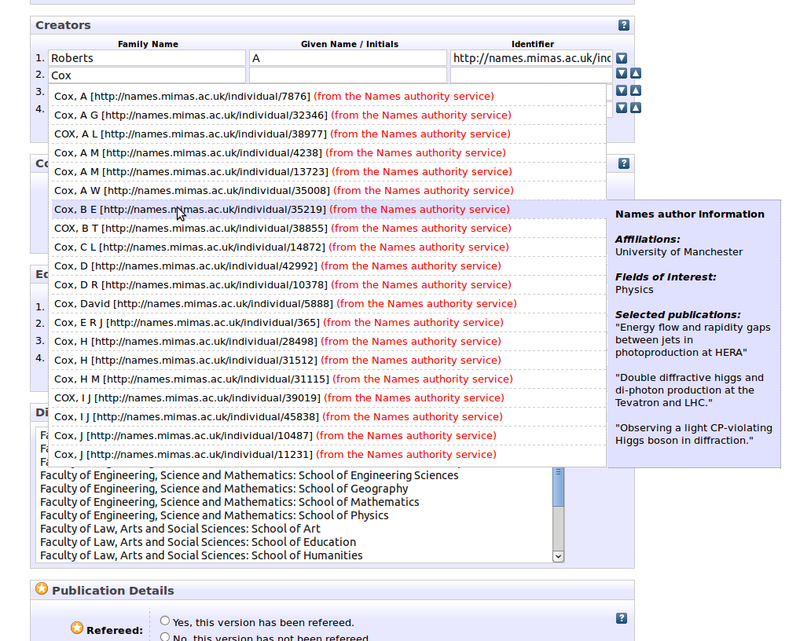 Comments on this work are welcome and we are also interested in working with you if you would like to include details of researchers from your institution in the Names system, to help improve the data which is returned from the API and the autocompletion plugin.